Description of "Todays Engineer and MBA to Tomorrows Future Leader"
Today 95% people start to question themselves will I be doing Coding and Technical work or support all throughout my life till retirement? Adding to that, the whole book market is crowded by all Technical Books. There is a complete shortage of any Blueprint Starter guide or Real time Templatized book for moving to Functional, Consulting or Strategic roles. ‘Today’s Engineer & MBA to Tomorrow’s Future Leader’ book gives the Roadmap and direction to many Engineers, MBAs and Graduates to match the Inspiration with their Aspirations. This will provide the platform to go up the value chain cycle towards Leadership and Transformational roles than just doing plain vanilla Technical, Coding, Support in their whole life. The question ‘Are you ready to Dream Big to accomplish being a Trendsetter than just a Trend follower’? Satya Sundar Brahmachari was born in Bhubaneswar, Odisha, in 1981. As a Practice and Thought Leader Satya brings close to 9 years of experience in Business and Technology across all Verticals, Practices & Horizontals working with the likes of Accenture, Oracle, Wipro and HCL. He has been awarded Top Expert in HCL Technologies among 90000 employees. Besides these he has been pioneer author of many publications & whitepapers. He holds a Global MBA degree in IT Systems & Management and B.Tech in Computer Science. Have rich international experience at the customer place in Australia, Europe, Africa and Asia-Pacific including US. He is an author by Passion and Conviction. Also Satya as a Knowledge Entrepreneur works for Society goals in free time. Leena Panigrahi was born in Bolangir, Odisha in 1987. She holds an Engineering graduate in BioTechnology. She is an author by destiny. She has started to put down her thoughts in writing books on new trends that can make a difference in normal people lives. Satya Brahmachari and Leena Panigrahi are married to each other and both as Knowledge Entrepreneurs works for Society goals in free time. For any feedback, observations and suggestions, please feel free to write to bookentrepreneurs@gmail.com. 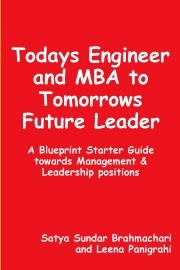 Reviews of "Todays Engineer and MBA to Tomorrows Future Leader"
I have purchased the book .This book is very very essential to all IT employees as a guide to be successful in their career.Recommend to buy the book. I am a Professor in a MBA college and last year Purchased the book. This Functional Book has a great learning exposure for all IT and MBA students.I am suggesting my students to buy the book. Thanks. I am a Engineer and bought the book before few month.I want to switch in to Functional Role role,when I saw this book on Pothi I bought.This book is guiding me a lot.Recommend to buy the book. I am a Engineer having 5 years of experience and bought the book last month.This book is guiding me a lot.Book blog is also very nice.Recommend to buy the book. I have purchased the book and believe me this is really a very necessary For all the Engineering and Management students.I am a Professor in a MBA College in Bangalore.Buy the book for your career Thanks. I purchased the book last month.I am a Assistant Professor in a Engineering College and read all the chapters.Very nice book for all IT people.buy the book.Thanks. I bought this book and I am working in a MNC as a Manager.I have read all most all the chapter.Very good book for all IT professionals.Buy and read once. Thanks to the authors. I bought this book last month,very useful book for all IT Professionals and students.I recommend to buy the book.Thanks to both the author.I have seen the book blog also,very nice one. Recently I have purchased the book,I am a software engineer and suggest every engineering and management professionals to buy the book. Thanks. I bought this book recently.I am a Professor in a Management College.All my students are now reading the book and recommending to buy the book.Thanks to the Authors. Very Good Book... I bought the book before 2 month .I am a Software Engineer and working in an MNC. Very Inspiring and helpful book for all IT employees.I recommend to buy this book. I bought this book last month.I am working as Manager in a IT company in Pune and read the book. Very Nice Book for all IT people. I purchased the book for my son.I am a Senior Manager in a IT company in Pune. This book is helping my son a lot in his work life.My son is a Software Engineer in Bangalore. I suggest to buy the Book. I purchased the book last month.I am a Professor in a Management College and read all the chapters.Very Nice book for all IT and MBA students.I suggest to buy the Book. I bought this book last month .This is a very good book for all IT professionals.I am recommending to buy the book for a better future career. I am a software engineer and bought the book.This book gives me the real confidence to be a success leader in future and now I am improving a lot.Recommending all my friends to buy the book. Last month I have purchased the book .This book is very very essential to all IT employees as a guide to be successful in their career.Recommend to buy the book. I have purchased the book last year .This book is very very essential to all IT employees as a reference to be successful in their career . I suggest to buy the book.thanks. Very nice book.Recently I have bought the book.This book will help each person to accomplish their dreams and ambitions to be a Future Leader.Thanks to author. I bought this book before 2 month and helping me a lot in my career,I am working as a Manager in a IT company.very Nice for better future in IT Industry. Recently I have Purchased the book and this book is very very beneficial for Fresher and also for experienced Professionals.Buy the book and fulfill all your dream and aspiration. Thanks a lot. Good Book.. I have purchased the book .I am a Management Professional in a IT company in Pune and this book is helping me a lot in my working life. I suggest to buy the Book. Good Book.. I am a Software Engineer and bought the book last year .I want to switch in to Functional Role role,when I saw this book on Pothi I bought.This book is guiding me a lot. I have purchased the book last month.I am a Management Professional in a IT company. This book is helping me a lot for my career growth. Buy the Book and be a Leader.Thanks. I am a Professor in a Management College in Ahmadabad and recently purchased the book..Very nice book for all Management students.Chapters are also easy to understand. Excellent book for Todays generation who wants to be a Leader in an organization. I suggest every engineering and management professionals to buy the book. I am working in a MNC as a Architect and recently purchased the book. I saw this book on Pothi, then I decided to buy the book. very Good book for all IT Professionals. I am working in a IT Company in Pune from last 5 years and recently purchased the book. I saw this book on Facebook, then I decided to buy the book. Good book. Thanks a lot to author. I am a Professor in a MBA college and before 3 months Purchased the book. First time, I have managed to come across this Functional Book and it's great learning exposure for all IT and MBA students.I am suggesting my students to buy the book. I am a Manager in a IT company and recently bought this book before 1 month,useful book which shows the path for a better leader in IT industry. Very Nice Book.. I am a Senior Manager and recently purchased the book,useful book for finding the right road map and direction to be a Leader.I suggest to buy the Book. I bought this book last year and I am working as Manager from last 2 years in a IT company in Delhi. Very Nice Book. I am a Manager having 10+ years of experience in IT company and last month purchased the book as one of my friend suggest me this book and I bought. Recommended to buy the book and utilize in your career. I am a Senior Manager in a IT Company in Pune and bought the book last month.I am recommending to buy the book for all IT people.This book will help you to accomplish your dream. I bought this book recently and I think this book is very good book for all IT professionals.I have seen the blog also,nice one.Recommend to buy the book. I am a IT Professional in Delhi.Before 2 months I purchased the book.This Book is very helpful for me to enable me in accomplish my dream.Suggest to buy the book. Very Nice Book for all IT Professionals.. I am a Consultant in a IT Company in Hyderabad and before 2 months purchased the book.This book is very good for all IT students for their career growth.Recommend to buy the book. I am working in a IT Company in Bangalore and before 3 month purchased the book.The chapters are really very helpful in office work and in my career also. Recommend to buy the book. Thanks. This book is very much essential for all the engineers and Management professionals. I bought the book recently and suggest to buy the book. Superb Book. I bought this book before 3 month,very useful book for all IT Professionals and students.Buy the book and read once. Thanks a lot. I bought this book before recently,I am a Professor in a Management College in Gujarat.Very nice book for all Management students.All of my students were asking about the book and all praised a lot. Thanks. Recently I have Purchased the book .I am working in a IT company in Chennai. This Book is the right book for all IT Professionals to accomplish their dream to be a leader. Thanks a lot. Book is necessary For all the Engineering and Management students.I am a Senior Professor in a MBA College in Mumbai and recently purchased the book. Thanks. I am a Manager having 7 years of experience in Industry and purchased the book as one of my friend suggest me this book and .This is a very helpful book. Thanks. I am a Consultant in a IT Company in Hyderabad ,before month bought the book.Nice book for all IT Professionals and Engineering students also. Very Good Book... I bought the book last year and I read all the chapters.I am a Software Engineer and working in a IT company Gurgaon.Suggest to buy the book. I bought this book last month.I am working as Manager from last 2 years in a IT company in Pune and read the book. Very Nice Book for all IT people. I purchased the book last month.Money Worthy Book. I am a Professor in a Engineering College and read all the chapters.Now I am teaching to my students by this book which helps them a lot.I suggest to buy the Book. Before 2 month I bought the book.This book is a necessity for all IT employees and students.I am suggesting all the IT people to buy the book for your future career road-map.